Timberwolves fan expectations are in a funny place. Heading into last night’s game in Sacramento, the team had a win/loss record of 28-29; under .500 and good for tenth place in the Western Conference. They are far removed from playoff contention. Minnesota’s road record was 12-18, which happened to be the exact same number of wins and losses that the Kings had on their home floor. With these facts taken under consideration, one would think that a victory — any victory — would generate some good feelings. But when the Wolves did win — by 11 points, no less — it just didn’t seem all that impressive. One is that the Timberwolves have underachieved compared to expectations. Wins like last night’s over the Kings feel overdue. According to Basketball Reference, the Wolves have an “Expected W-L” of 37-21; a record that would have them in sixth place and in the thick of the playoff picture. Instead, here we are at 29-29 and most likely looking forward to another draft lottery. Another explanation for a lack of excitement is that the Wolves have manipulated our expectations in some weird ways. Many of the losses have resulted from sputtering fourth-quarter performances against good teams. But against bad teams like the Sacramento Kings, the Wolves have often won in convincing fashion, many times building second-half leads so large that the starters sit out of the final period. Last night, the starting unit, with some help from Dante Cunningham, changed a 3-point halftime deficit to a 14-point lead after three quarters. Familiar front-running feelings crept in. But from that point on, things did not go according to trend. The bench struggled and the lead was cut down to 7 with 8:36 to play. Twitter blew up with criticisms of Rick Adelman and his stubborn refusal to play Ricky Rubio during fourth quarters. (Ricky had been sitting out.) Then Rubio’s enigmatic sub, J.J. Barea, made a pair of layups. A subsequent Pekovic layup increased the lead to 10, before Rubio checked back in with 5:14 to go. A win was in the bag now, right? 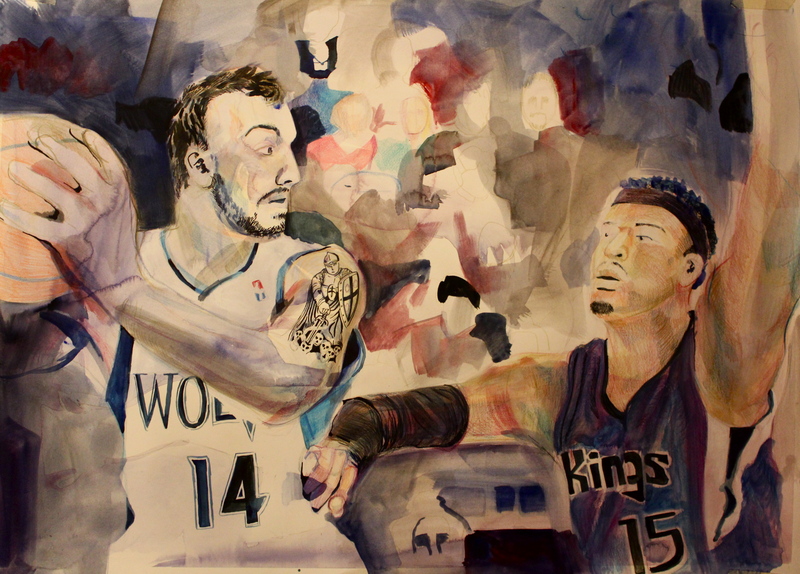 Over the next 3:05, the Kings went on a 12-4 run and cut the Wolves lead to just 2 points. Their next possession ended with a bad Rubio turnover. Some panic was inevitable at this point. Of course, they recovered and won the game by 11 points. That’s the important thing. But there was almost a “crisis averted” sense of relief when the final horn blew. That’s how I felt anyway, and I’m just trying to figure out why that is. I think some of it is due to the season-long pattern of large victory margins and narrow defeats. If it isn’t going to be one then it’s going to be the other. That sort of thing. A final possible reason for not extracting more joy from a not inevitable win is this entire notion of .500 basketball. It’s obviously unfamiliar territory here. The Wolves’ best winning percentage over the last 8 seasons was .402. And that was 8 years ago. They were .390 the next season; Kevin Garnett’s last one in ‘Sota. After that… well, you know the rest. Injuries were to blame for last year’s struggles. And the year before that, Ricky Rubio’s injury combined with horrible roster depth to derail a promising season. But the fact remains that it’s March and 58 games into the season and the Wolves are .500. They don’t go on long streaks of wins or losses. That’s sometimes cause for relief and other times frustration. And other times anxiety. And when Adelman answers the Twitter call for Ricky Rubio with 5:14 to play and the immediate results are disastrous, I think it’s reasonable kneejerk to feel a combination of frustration (If this doesn’t work, then what next?) and anxiety (Is this team just cursed?). The season’s final opportunity to bust these trends in a positive way began last night. The Wolves beat an inferior team. Tomorrow they play another one at Denver. Wednesday, they play another at home when the Knicks come to Target Center. There are two more Eastern Conference teams not named the Heat or Pacers coming here after that, before a quick trip to Charlotte and another matchup with the Kings; this time at Target Center. If the Wolves can make hay and win all of those games and get to 6 over .500, then we re-entertain the Playoffs Possibility. But I’m not sure they can afford to lose a single one of em. Not with so much ground to gain and another team between them and the 8 seed. So those are the stakes, and a few reasons for why a Timberwolves fan could ever feel anything but pure joy after a double-digit road win. I have to disagree with you–I felt pure joy after the Wolves won. They have choked too many games away already for me to care at this point if they win ugly or not. And Rubio actually made a clutch shot, proving somewhere Unicorns were flying in heaven. Ruby Gay missed a lay up! Phew. That’s when I started to tell myself they might not blow the game. And then Rubio with that three-pointer! Was it ever going to leave his hand … such a labored shooting motion. It seems like they could win the next 6. That would make 8 in a row. But, I’ve told myself almost that same thing earlier this season and then they lost to the Wizards and the Kings! If they play well enough they won’t be in a position to tank, will they? that is, the 9th seed will be going for the playoff and the 11th seed may be 5-6 games (or more) worse than the Wolves at the 10th seed. This pick is going to Phoenix! This “Top 13 Protected” pick status could lead to some bizarro incentives down the stretch of the season. But like you said, we’ve told ourselves the “they could win 6 in a row” thing before and it didn’t happen. Denver, tomorrow’s opponent, has a slightly better home record (14-15) than the Wolves’ road record (13-18) so the dream could sputter right out of the gates.